AgustaWestland, a Finmeccanica company, is a helicopter manufacturer with a growing global fleet of over 4,800 helicopters and supporting over 1,400 customers. The company employs about 3,200 people at its facility in Yeovil, Somerset, and 10,000 more mainly in Italy, Poland and the USA. The area I work in is Customer Support and Training. Once the Business Unit has sold the helicopters, and the production area built and delivered them, our responsibility is to provide ‘through-life training’ and ‘in-service support’ to ensure our customers maximise the operational use of their helicopters. We have a number of undergraduate placements, where students are with the company for a year. Over this time they do various 4-6 months placements moving around within the company and we have some who then come back into our 2-year graduate scheme. I expect students to come in highly motivated, energetic and with a very good core base of up-to-date skills in terms of technology, computing and presentation skills. I also expect them to come with an enquiring mind because all of those skills are immediately applicable to the roles we put them into. After this, it’s the task-specific knowledge that we are looking to provide for them. We’re looking for self-starters really. All the students I’ve worked with from Plymouth University have very much fitted that bill. They’ve all come with excellent core capabilities and core strengths, such that they have fitted into our teams immediately. I think there’s an element of resilience that they have because they’re coming into a working environment. And I’ve always been very pleased that they come to us to ask for more work, keeping themselves busy and getting the most out of their time with us. When working with Plymouth University students on any project the benefit to me is that they are so questioning. The questions they come back with just make us think twice in terms of why do we do it like that? It’s the open mindedness of the students that challenges us. That helps us to be innovative as a company. The Aerospace industry is understandably safety-orientated and so to have a fresh pair of eyes helps to drive change, it makes us question. It can be hard work taking on students. You have to be prepared to invest time in them. But this investment can be rewarding as the work and feedback you receive benefits your team output as well as identifying new opportunities and ways of working. And if we then employ the students as graduates they are up and running straight away, you can immediately give them projects, they’re ready from day one. 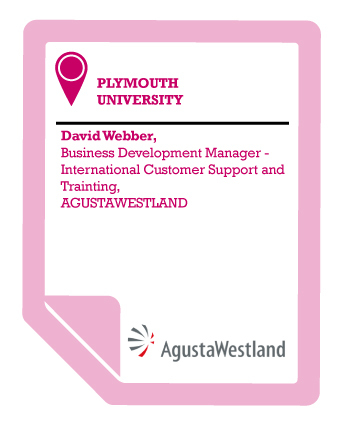 I would definitely recommend working with Plymouth University, taking advantage of everything I’ve said; their open mindedness and challenging outlook in addition to their up to date technology and business knowledge.